« Morning Free Association 4/19/16 – Insurrection! These questions were answered last week, prior to some Bruins developments, so while the ship has sailed on a couple matters, at least you can see how the B2B staff felt about things before we knew what would come to pass. 1. Now that it’s all over, what do you think the Bruins’ biggest problem was this year? Miss Muse: Obviously it was their defense. If you give up the puck right in front of Tuukka, of course he’s gonna be caught off guard. The defense was either old and hurting/slow or young and too inexperienced. IntentionallyWidenberg: They had a hole in “de fence”. Sure, they lost their will in the stretch – they should have come out hotter vs Panthers, Devils, Senators. Motivating this group was an issue on multiple occasions (though perhaps not as much as last season). Also, an issue was in their attitude – they lost three straight in the Cali trip, and seemed satisfied with that because they played well during parts of those games – that isn’t good enough. But at the end of the day, their Achilles heel was their defense. Chara was slow, and can no longer use his long stick to cover for the gaffes of his linemates. His giveaway rate was high (even for a #1D) and when he’d man the blueline he’d treat the puck like a hot potato and fling it into the slot, even if the shot wasn’t there. Kevan Miller was played in too many high stakes situations for a player of his experience/skills/speed. Early in the season he was a disaster in that role (though he did invent the crab dance!). The last month, he was pretty solid, but still relied upon too heavily. Seids was slow and ineffective at his role. Krug was okay, but he was definitely stretching himself defensively as a 2nd-pairing guy. Colin Miller was exciting to watch, but he plays the Bruins zone system as if he were playing man-on-man coverage. He’s fast enough to recover from his mistakes, but is out of position a lot. The front of the crease seemed to be enemy territory throughout most of the year. Goals Against went up by a bit as did Shots Against, and the eye test suggests they weren’t as effective as in the past at keeping shooters to the periphery. Satan81’s Sister: Lack of talent. Carvinbass18: Not having a true 2nd-pairing on the defense. After Chara, the team was built with bottom pairing / 7th defender type players. Satan81: The defense was the biggest problem this year, but something I can’t out of my head is their horrible home record. If they were even close to .500 at home, they’d be in the playoffs. The lack of an explanation for it makes it all the more maddening. Phonymahoney: Defense and consistency were the two big issues, and the consistency issue stems from the Bruins’ somehow too-young-and-too-old-at-the-same-time defensive corps. 2. 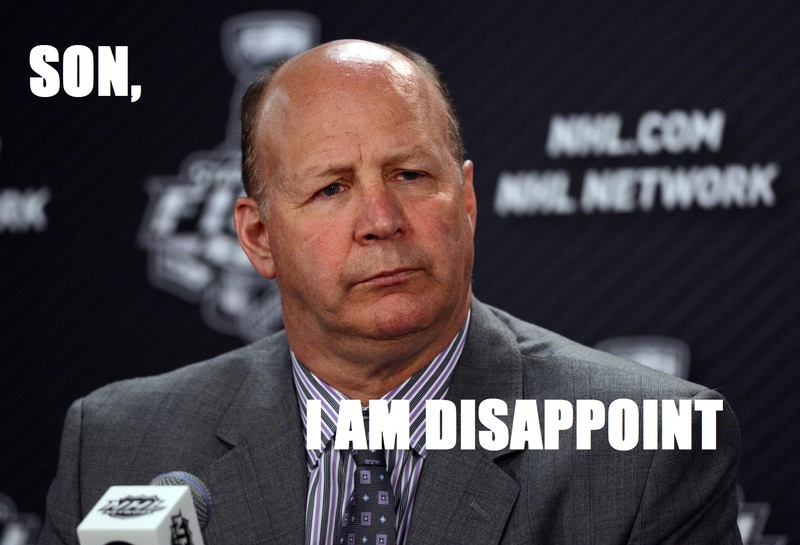 Should Claude Julien be fired? Why or why not? Miss Muse: I don’t want him to be but it’d be the easiest thing for management to do. Not the right or best thing, but the easiest. IntentionallyWidenberg: Claude could have done a few things better, but he had this team – that was considered unlikely to make the playoffs in the first place – in first place in the division for a brief period of time. Pundits were nominating him for the Jack Adams award in the media. He didn’t build the roster. He didn’t make his best defenseman grow old. He didn’t trade his 2nd-best defenseman for a hill of beans. He didn’t destroy his 3rd-best defenseman’s knee. Did he have any influence in his best defensive rookie’s decision to leave town in spite of receiving a contract offer that was more than fair? So if the biggest team problem was genuinely due to matters beyond his control, it’s hard to justify demanding his head. Also, there is the question of replacing him. Replacing a good head coach is always a tricky proposition. It is much more likely that any new coach will not be be a good fit for the team. Sometimes you fire Torts, and get Alain Vigneault and it all works out. Sometimes you fire A.V. or Pat Quinn, and set yourself up for a decade of failure with a coaching carousel of futility. If you don’t have the right candidate lined up, you need to be very conservative about firing a coach. Satan81’s Sister: A little from Column A and a little from Column B.
Carvinbass18: No, as of right now there is no coach available that could direct this team back to its winning ways. Satan81: When I look at the number of times the Bruins had an opportunity to take control of their own destiny and came up short, I can’t help but feel that’s on the coach. I do think that Julien accomplished a lot with a flawed roster and he deserves credit for that. My gut tells me that I’d feel better if he remained with the team, but can understand that he might need a change of scenery. Phonymahoney: While I wouldn’t riot if they do fire him, I don’t think they should. This is a roster problem, not a coaching problem. I think firing him is the easiest thing for them to do so they have a big change they can point to as having been made, but I don’t think it’s a smart thing to do. 3. If Claude Julien is fired, who would be your ideal replacement? Miss Muse: I honestly don’t know. IntentionallyWidenberg: Not sure. I might take a flyer on Ken Hitchcock – since the Blues will fail in the playoffs, and he will get fired. NOT Mike “I haven’t coached a meaningful period of hockey in over 16 years” Milbury. Satan81’s Sister: Claude Julien would be my ideal replacement if Claude Julien is fired. Carvinbass18: Guy Boucher. If only so I can post Le Chiffre gifs during all the game threads. Satan81: If Ken Hitchcock is available, I think he’d be a good fit with the Bruins. For that matter, Julien would be a good fit with the Blues. Perhaps both coaches need a change of scenery, and a swap could work well for both coaches and both teams. Phonymahoney: I love The Butcher, Guy Boucher, AKA Le Chiffre. Not only is he passionate and fiery, his system is one where solid defense doesn’t mean a complete and utter lack of offense. Also, he’s hilarious to watch. 4. Do you place more blame on Peter Chiarelli, or Don Sweeney? Miss Muse: Chiarelli. I think Don is still cleaning up his mess he made as #DogGM. Carvinbass18:Chiarelli. It’s just too early to blame Sweeney for this. Mistakes have been made, but they were not season-collapsing problems . Satan81: Peter Chiarelli. Too often he rewarded players for what they had done rather than pay them for what they were going to do. Phonymahoney: Chiarelli. I don’t think Sweeney’s been at it long enough to assign blame to him; he’s made some questionable moves, and some great moves. 5. What move/lack thereof do you think had the biggest impact on the team? Miss Muse: I don’t understand how you get rid of Boychuk in order to sign Dougie (or so was said earlier) and not know how unhappy Dougie was in Boston, you know? I mean if Dougie wasn’t honest with him, that’s on him, but I’d hate to think PC didn’t check in with Dougie on how he was doing and feeling in Boston before banking on him and trading Boychuk. Those two moves are going to be felt for a long while. Satan81’s Sister: Chiarelli: For me, I think the biggest mistake was trading Boychuk and hedging their bets on Seidenberg. I want a redo on the Boychuk trade. Please can we have Boychuk back? Sweeney: He traded for Rinaldo. Like, intentionally traded for Rinaldo. And then there’s the McQuaid contract. There’s not enough OK Beer to make me OK with that whole thing. Carvinbass18: Biggest impact was the Boychuck trade / Seidenberg contract. Satan81: Signing Dennis Seidenberg to a contract extension rather than Johnny Boychuk. Hindsight is 20-20, but this one’s caused both short-term and continuing problems. Phonymahoney: The Seidenberg / Boychuk / Hamilton debacle. I know Seids wasn’t injured at the time, but how do you pick him over Boychuk if Boychuk is four years younger and at least as good at the time? And how do you have no idea at all about where Hamilton stands as far as re-signing goes? Maybe Dougie was playing it close to the vest, or maybe nobody thought to ask. I don’t know. 6. Which player(s) pleasantly surprised you this year? Miss Muse: I really like both Frank Vatrano and Noel Acciari. If I had to choose, Acciari kind of came out of nowhere and I think he’ll be a good solid 4th-liner. I like his work ethic. Spooner – learned defensive aspects of game, will try to make hits. Beleskey – did a lot of things right even if point production was low. Marchand – I expected ~25 Goals, not 37. Gustavsson – better backup than I thought. Satan81’s Sister: Spooner. Seems like this kid is starting to come into his own. Carvinbass18: Marchand and Krug. Despite Marchand being a staple in the line-up, I did not expect that type of offensive outburst from him. Krug stepped up all year to become our 2nd best defender. Satan81: Ryan Spooner and Matt Beleskey. Spooner grew a lot as a player this year, going from a big question mark to proving himself as an important part of the team. We saw some hints of a Marc Savard style player in him. With Beleskey, there was the question of whether his scoring in Anaheim was largely the product of playing on a line with Ryan Getzlaf and Corey Perry or if he was capable of driving offense himself. He proved the latter this season with a career high in points despite not having top line minutes. His work ethic, drive, and play without the puck were excellent. Phonymahoney: Noel Acciari has become my second favorite Bruin. He is centering a fourth line that feels like it’s had fifteen different linemates in the first two thirds of the season. While I don’t know that Frank Vatrano is someone I want to stay on the fourth line, Vatrano – Acciari – Ferraro (the Prince Spaghetti line?) has really gotten the job done. I’m also really happy with Matt Beleskey, who may not show up on the scoresheet every night, but he gives it his all each game, and he played really well with Spooner, who also has impressed me by showing he’s a valuable part of this team. 7. Which player(s) disappointed you? Miss Muse: Brett Connolly just can’t seem to rise to the occasion when given the chance to shine. I know he wants to stay here, but he needs to give the Bruins a reason to believe him. Seidenberg – he seems to have never gotten his game back since the knee injury. Krejci – disappeared on a few occasions. May have been hiding injury, but regardless, results weren’t as good as we needed/I hoped. Satan81’s Sister: Connolly. Not that I ever thought he’d be the next Bergeron, but I thought he would be somewhat useful. He was not. Carvinbass18: Outside of the defense, Brett Connolly. For someone who was supposed to be a terrific shooter he Reilly Smith’d his way to a boring season. Satan81: I have a hard time singling out one player as disappointing, but rather I have a general disappointment that not one of the defensemen out of Killer, Chiller, Trotman, Morrow, and Irwin were able to step up and claim a 2nd-pair role. That’s a very serious concern for a team that will have a limited ability to acquire free agent defensemen. Phonymahoney: Stripes asked me this at the Providence game a couple weeks ago and I said Connolly and Pastrnak, but the more I think about it, after missing a ton of games due to injury, Pastrnak came back with a vengeance. He looked stronger, he won battles, he scored goals… I can’t complain. 15 goals in 51 games? That’s good for 20-25 goals in a full season. No problem there. With that, I’m disappointed in Brett Connolly’s performance. After seeing him in a handful of games last season, I really liked his forechecking and thought he’d make a difference. He hasn’t. Maybe next year. 8. Regarding Loui Eriksson, what do you think will happen? If he’s gone, it leaves a big hole – what would you do with the forwards? Miss Muse: He’s been here, what three years, and we’ve missed the playoffs twice? I love the guy and appreciate everything he’s done for us on the Bruins, but I’d be surprised if he didn’t walk to another team that could afford what he thinks he should get and to somewhere he may think is further along in their rebuild or a legitimate contender for the Cup. It would be a big hole to fill if he’s gone, but again, I don’t think our problem’s in general been scoring and we should focus on defense. Maybe we end up trading one of our prospects for a high spot to get a good defenseman and if Loui is gone, I could see one of the prospects being called up maybe a little earlier than they should be. I like Pasta. I like Vatrano. I could see them as trial pieces for the spot Loui leaves behind next year. Intentionally Widenberg: He’s gone. If they were going to get him signed, it would have happened by now. He’ll go UFA, and someone will give him a contract with term. I see the Bruins react by signing Stempniak, and top lines will be 63-37-20, 39-46-88. Hayes and Connolly will get buried/traded/let go. Satan 81’s Sister: Unless they can magically create cap space, sadly I think I lose another Swede. As for a replacement, uh, sign that Vesey kid? Satan81: Loui scored 30 goals so he’s certain to get the price he’s looking for in Free Agency. The Bruins won’t have the cap space to match that and meet their other needs. If they can re-sign Stempniak, then Pastrnak should be able to step up as the top line right wing. That puts Connolly, Hayes, and prospects in competition for the third line right wing spot. Phonymahoney: As good as gone. I think he was a good addition to this team and he had a great year, but because of his great year, he’s going to command some good money out on the market. If you’re Loui, why would you ever take money to stay here with the defense the way it is? I think Pastrnak will be just fine playing 1RW. Then, we should bring back Stempniak to play with Bergy and Marchand. 9. Is there a player you’re confident the Bruins will trade or buy out this offseason? Who? Miss Muse: Confident, ha. I have no idea what’s in Sweeney’s bag of tricks for Draft Day and over the summer. Maybe Connolly. 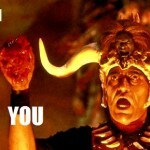 IntentionallyWidenberg: Seids will get bought out. Satan81’s Sister: I can’t say with any confidence what this front office might do. I’ll I can do is buckle up and enjoy the ride. Carvinbass18: I’m not confident on anything per se on the Bruins losing via trade buyout. If they decide to trade Krejci and buy out Seidenberg, I wouldn’t be surprised. Satan81: Given the continued logjam at center and the continued development of Seth Griffith, I’d expect the Bruins to move on from Alex Khokhlachev. I don’t expect a buyout of Seidenberg’s contract, but I think the Bruins will try to move him starting on January 1 when his full NTC ends and modified NTC begins. I’d expect the Bruins won’t find a taker for him and will buy him out the following season. Phonymahoney: I’m confident they address the Seidenberg situation, whether it’s by trading him and eating half of his salary, or by buying him out. I think either Connolly or Hayes are moved, but I’m betting it’s Connolly, as Hayes looked better to me. That’s it for now. Thanks for playing along, panelists. We’ll be publishing more of these Q&A pieces in the future. Tagged Alexander Khokhlachev, Boston Bruins, Claude Julien, defense, Dennis Seidenberg, Dougie Hamilton, Frank Vatrano, Guy Boucher, hockey, Johnny Boychuk, NHL, Noel Acciari, Playoffs, postseason, Ryan Spooner. Bookmark the permalink. I think it’s kind of neat how our answers are pretty similar to each other’s and it’s not like any of us knew what the other person would be writing down. I was going to answer all these questions that I repeatedly failed to answer when you asked them, but really, I don’t have much to add here.